IRNA – Iran is ready to enhance relations with Dakar in every field, said Iran’s President Hassan Rouhani on Tuesday. 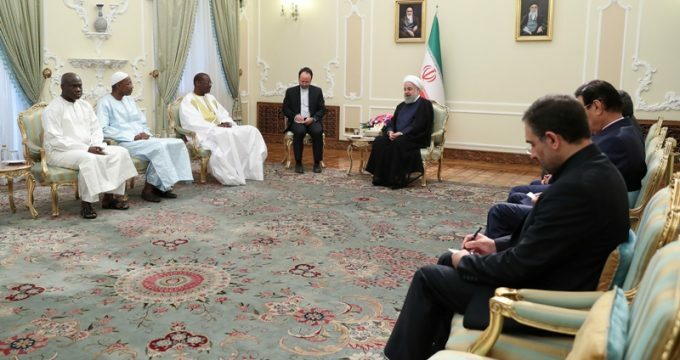 “Deepening relations with Senegal, as a friendly Muslim country, has always been important for Iran,’ said President Rouhani in a meeting with the new Senegalese Ambassador Amadou Sow to receive his credentials. He also went on to stress the importance of collective campaign against terrorism in Africa and the Middle East and added, “Iran is ready to develop its relations with Senegal in fighting terrorism”. New Ambassador of Senegal to Tehran presented his credentials to the President and said that Senegal was determined to cement ties with Iran in all fields of mutual interest, especially economy. Sow added, “The presence of Iranian businesspeople in Senegal is an honor for us and the government has considered special visa facilities for Iranian businesspeople”. Iranian president today received the credentials of seven new ambassadors from Senegal, South Africa, Japan, Belgium, Bosnia and Herzegovina, the Netherlands and Qatar.